We picked up where we left off on Pretty Little Liars Season 5 Episode 1, as Ezra has been shot and the ER doctors are working hard to save him. 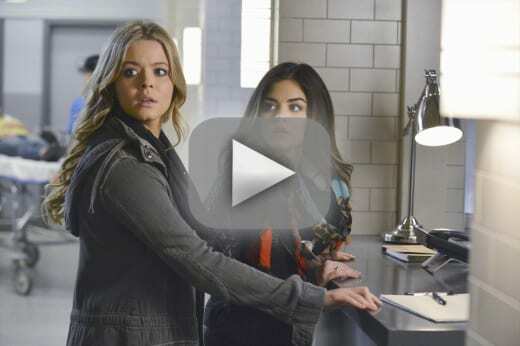 Unfortunately, A is waiting for the opportunity to keep Ezra from telling anyone who he/she is. The liars are able to distract A from Ezra by using Alison as bait; however, the girls learn just how difficult it is to keep an eye on A when a whole bunch of masked and hooded As taunt them in the park. 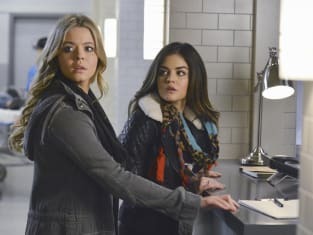 The girls hide out in a theater that Ezra once showed to Alison, except for Aria who waits to see if Ezra will pull through and to find out who shot him.